This Cornerstone project acknowledges that astronomy needs to be developed in three key areas: professionally (universities and research); publicly (communication, media, and amateur groups) and educationally (schools and informal educational structures). The focus is on regions that do not have strong astronomical communities. The implementation is centred on training, development and networking in each of these three key areas. This Cornerstone project uses the momentum of the IYA2009 to help establish and enhance regional structures and networks that work on the development of astronomy around the world. These networks support the current and future development work of the IAU and other programmes and ensure that developing regions benefit from the IYA2009 and the work of the other Cornerstone projects. 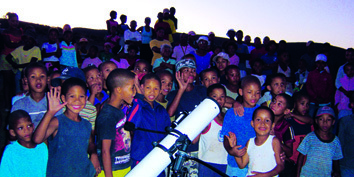 It should also address the questions of the contribution of astronomy to development. Go to the Developing Astronomy Globally website.